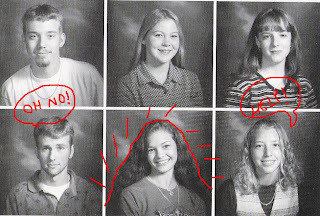 It's Flashback Friday over at My Tiny Kingdom, and I figure nothing says flashback like pulling out the old high school yearbooks. 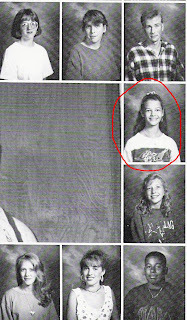 These are scanned straight out of my yearbooks, so ya'll excuse the poor quality. You'll notice each photo has a single common denominator, and that is my giant, all-encompassing hair. Nobody does big hair like I do. 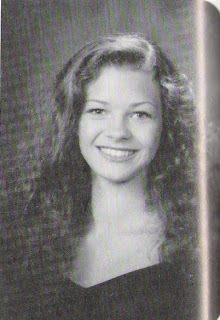 I'd like to claim that it was the 80's and that I was trying to go for the big hair look, but alas, this was the late 90's and my fluffy yearbook 'do was AFTER flat ironing and roughly 6 gallons of anti-frizz serum. And still the hair could not be tamed. Puberty was not my friend, ya'll. Here I am as a freshman in high school, fresh-faced and eager to begin my journey. It was natural to be optimistic; Up until this point, the hair had slept, dormant. By the time I was a sophomore, I had put away my child-like wonder and enthusiasm and adopted a more worldly outlook. The hair also exerted itself by taking over my shoulders. By the time I was a junior, my hair was completely out of control and was actually breaking the boundaries of the photo and creeping into neighboring frames. This was the year that the guys who sat behind me in English stuck pens and pencils into my hair to see how many they could get to stay. I think the record was something like 16 pencils and a TI-85 graphing calculator. (I'm serious). At last, senior year. I have completely surrendered and relinquished all control to the hair, and it has, in its infinite hair wisdom, become curly. Together, it and I have come to somewhat of a compromise. I quit trying to beat it into straight submission and let it embrace it's natural curliness and, in turn, it has quit frizzing out and eating other classmates. And they say you don't learn anything useful in high school. ***Flashback Friday Bonus picture! 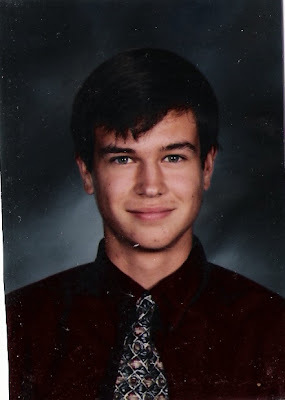 While digging around for my senior class photo, I came across a picture of the hubby back when he was in high school. So as a special treat...behold! The hubby! Isn't he a total hottie? I'm a curly-headed girl, myself, but I still straighten the stuff out. You know, when I have a couple of hours. My hair has always been kinda meh. I've come to grips with it, but there was a time when I would've killed for hair like yours! Beth you're absolutely adorable, and Tony really was a cutie! Ha! Remember when we both used to curl our hair in the morning, me to give mine some body and you to try to control the over-abundance of body? Whoa - that hair is threatening to engulf the people next to you. I did the same thing in the 80's. 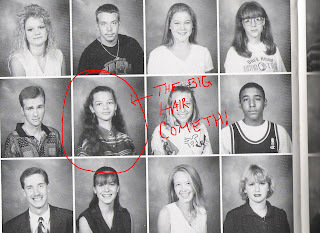 There's nothing like bringing out the ol' yearbooks. I had my Sunday School class(3rd & 4th graders) laughing hysterically at mine. Thanks for stopping by. Woohoo! I did a hair history post on my blog a few years ago. Now, being A Much Older Chick, I did do high school during the 80s, which, when coupled with the fact that I spent those formative years in New Jersey, means I had HUUUUUUUUUGE hair. haha.. The whole time you talking about your hair & kept noticing how I knew ALL of the peeps in your yearbook picture. I wonder how that could be. Hmm.. Strange coincidence maybe?